Illinois' Katie Stadick (12) and Jocelynn Birks (7) attempt to block Louisville's hit during the game vs Louisville at Huff Hall on Friday, Aug. 28, 2015. Illinois won 3-0. The No. 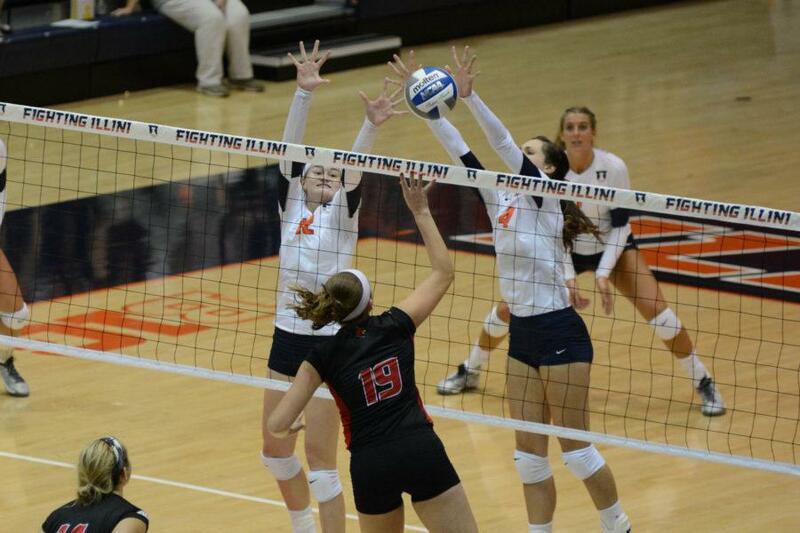 6 Illinois volleyball team (7-1) travels to Tempe, Arizona, this weekend to play in the Red Lyon Invitational. The Illini will face Texas Southern (2-6) on Friday at 12 p.m. before Saturday’s double-header against UNLV (6-3) and Arizona State (8-0) at noon and 9 p.m., respectively. In last weekend’s Shocker Classic, head coach Kevin Hambly’s team swept the competition: the Illini beat then-No. 21 Kentucky, South Dakota State and Wichita State in 3-0 sets. Illinois has now rattled off four straight wins, thanks to its deep, veteran-laden roster. Gardner finished her 2014 campaign with 594 kills (14 matches with 20 or more) and earned All-Pac-12 honors for the third-straight time in her collegiate career. Hambly mentioned freshman setter Kylie Pickrell and the towering duo of senior middle blocker Mercedes Binns (6-foot-3) and junior outside hitter BreElle Bailey (6-foot-4) as other players to watch for. Fortunately for Illinois, players like junior middle blocker Katie Stadick, junior outside hitter Michelle Strizak and sophomore libero Brandi Donnelly have been consistent since the team lost its last match — to No. 2 Stanford on Sept. 4. That experience will be key for the Illini heading into competitive Big Ten play. Illinois opens conference play against Maryland on Sept. 25 and travel to Rutgers the next day. Though Hambly acknowledged that the Illini defended extremely well in a weekend that included a 25-9 win over South Dakota State, he made it clear that defense is still a focal point in practice. He explained that hitting percentage can be misleading sometimes, because a .400 effort, for example, might come at the expense of the other team scoring at the same clip – meaning it’s a wash.
As a result, Hambly will continue to shore up his defense before facing high-octane opponents. “We want to make sure we can stop teams like Penn State, Texas, Wisconsin, Minnesota, Nebraska and those guys,” he said. Stadick echoed her coach’s feelings toward team defense.